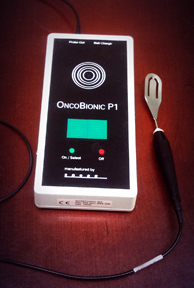 In a phase II study, 41 patients with hepatocellular carcinoma (HCC), a liver cancer that often does not respond well to chemotherapy, were treated with very low levels of an electromagnetic field emitting from a spoon-like device placed in the patients’ mouths. “When you take the mouthpiece and put it in your mouth the body becomes an antenna – the whole body receives a tiny but fairly homogenous amount of radio-frequency,” Pasche says. Pasche believes this a promising therapy that could become a standard of care in the near future. The therapy is ready for an FDA-registration study and randomized trials, which will be initiated at UAB upon funding being secured for the project. The technology also is in the beginning stages of being studied in breast cancer patients, by Pasche together with UAB collaborators Andres Forero, M.D., and John Carpenter, M.D.